Virupa (Skt. Virūpa; Tib. བི་རུ་པ་, བི་ཝ་པ་, Wyl. 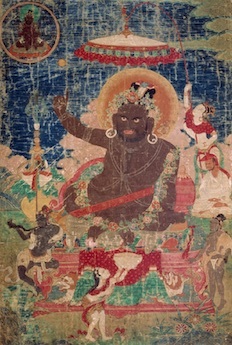 bi ru pa or bir wa pa) was one of the eighty-four mahasiddhas of India and an important source of the teachings set down in the Lamdré of the Sakya school. He is also known by the name Tutop Wangchuk (Tib. མཐུ་སྟོབས་དབང་ཕྱུག་, Wyl. mthu stobs dbang phyug). Acting as the abbot of Nalanda University, he secretly practised tantra during night time and eventually encountered a vision of Nairatmya who provided him with subsequent empowerments. Due to his controversial tantric behavior after this event he left the university and took the name 'Virūpa' (ugly one).